Description Cabanel, a professor of painting at the École des Beaux-Arts in Paris, specialized in portraits of "High Society." Here, he depicts the Swedish soprano Christine Nilsson as Pandora, the woman in Greek mythology who opened a forbidden box, releasing all the troubles that afflict humanity. 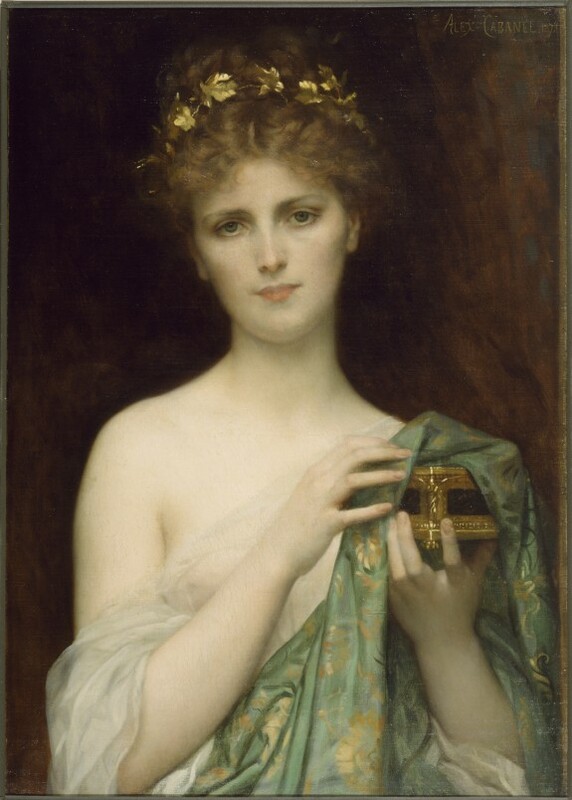 Alexandre Cabanel, la tradition du beau. Musee Fabre, Montpellier; Wallraf-Richartz-Museum, Köln. 2010-2011. Provenance Purchased by William T. Walters (through George A. Lucas as agent), Baltimore, October 26, 1873 ; inherited by Henry Walters, Baltimore, 1894; by bequest to Walters Art Museum, 1931. The Diary of George A. Lucas, p. 384.